The Hanseatic League (German: Hanse) was an alliance of North German and Baltic cities during the Middle Ages. The Hanseatic League was founded for the purpose of joining forces for promoting mercantile interests, defensive strength and political influence. By the 14th century, the Hanseatic League held a near-monopoly on trade in the Baltic, especially with Novgorod and Scandinavia. 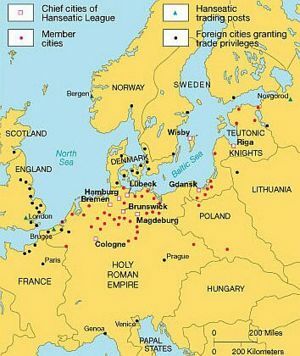 The most important members were the cities of Hamburg, Bremen and Lübeck. As of today, these cities refer to the Hanseatic League in their official names: the Free and Hanseatic City of Hamburg, the Free Hanseatic City of Bremen and the Hanseatic City of Lübeck. The league also included at least for part of the time cities like Cologne (until 1475) or Berlin (until 1442). This page was last modified on 26 September 2018, at 12:14.